Our little Town of Weaverville has two educational programs that promote the use of native plants in landscaping. Since 2009, the Town has been certified as a Community Wildlife Habitat with the National Wildlife Federation. This program, known locally as Weaverville Wildlife Habitat, is aimed at encouraging residents to create wildlife-friendly habitats surrounding their homes in an effort to compensate for habitats lost through development. Also, with the assistance of a grant from the state, the Town recently developed extensive educational materials aimed at assisting residents in controlling invasive exotic plants and replacing them with western North Carolina natives. The extensive plan for replacing invasive exotics with native plants in Weaverville is also a valuable reference for those gardening with native plants: Invasive Exotic Plant Management Plan For The Town of Weaverville, NC. 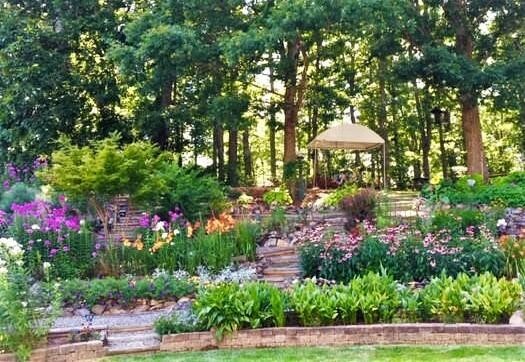 In keeping with these ongoing programs, the Garden Club of Weaverville encourages the practice of natural landscaping, defined as the practice of cultivating plants that are native to the southern Appalachians. In addition to providing resources for native wildlife species, we recognize that landscaping with native plants reduces dependence on artificial methods of maintenance such as chemical fertilizers, mowing, and watering other than by natural processes (rain). In particular, reduction of areas maintained in turf grasses (i.e. lawns) helps to minimize contamination of waterways by fertilizers and pesticides, use of carbon-based fuels, and demands on our water supplies. Thank you to Dr. Alicia Hulse for this section of resources and inspiration!